Save Oaky Woods - Thank You For Helping To Save Oaky Woods! Thank You For Helping To Save Oaky Woods! Thanks to your strong support we were able to save a large portion of Oaky Woods from development, insuring that this very valuable wildlife management area can be enjoyed for future generations forever! Oaky Woods now is comprised of 13,240 acres and full information about enjoying Oaky Woods WMA can be found in the GA DNR Hunting Regulations booklet or go to www.gohuntgeorgia.com. This website will be maintained as a source of news and information on Oaky Woods and if you have anything to share, please contact us or call 478-953-9320. I hope to see you soon in Oaky Woods! Our next hike is scheduled for February 16, 2019 at 9:00 AM. We will meet at 9:00AM at the corner of Oaky Woods Road and Highway 247 (next to Frito-Lay). Rain or other inclement weather cancels - check this website for updates. Hikers can expect to see the limestone/fossil ridge where the whale bone was found and an old moonshine still. Walking will be less than 1.5 miles for all sites. Please be aware that you may encounter bugs, snakes and other wildlife. The terrain is unlevel and hilly, but not difficult. Slips and falls are possible. Hikers should wear appropriate hiking shoes and clothes. If you have mobility or serious health issues, you should NOT go on this hike. The hike is free but all participants must sign a waiver of liability form and children between the ages of 10 and 16 must be accompanied by an adult. Children under the age of 10 are not allowed. 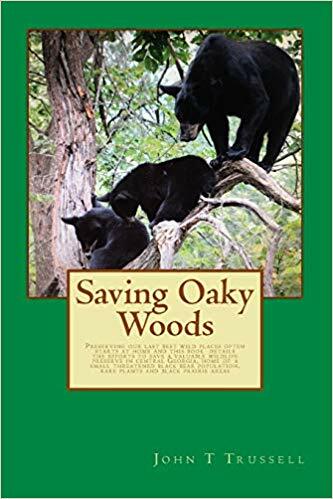 Saving Oaky Woods, a new book by John T. Trussell, is now available! Saving the last best wild places on earth sometimes starts at home and this book details the efforts to save a valuable wildlife preserve in central Georgia, with a small threatened black bear population, rare plants and very special black prairie areas. The effort was successful and the stories detailed here may help and motivate others to save other wild places in danger of vanishing. All books signed by the author.